shopping centers that could spur regu- latory issues at the prospect of its be- coming even more concentrated. 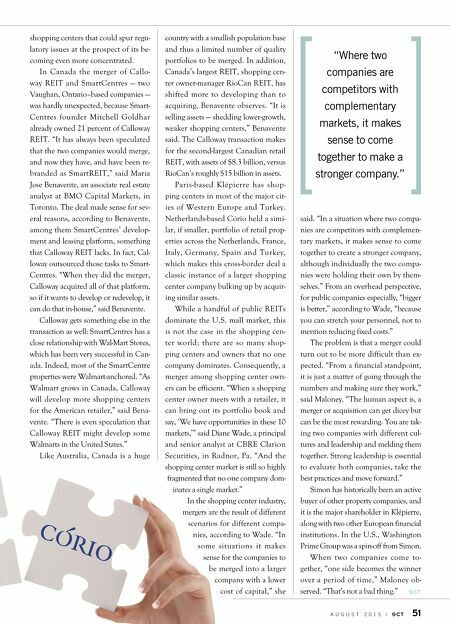 In Canada the merger of Callo- way REIT and SmartCentres ó two Vaughan, Ontario–based companies ó was hardly unexpected, because Smart- Centres founder Mitchell Goldhar already owned 21 percent of Calloway REIT. "It has always been speculated that the two companies would merge, and now they have, and have been re- branded as SmartREIT," said Maria Jose Benavente, an associate real estate analyst at BMO Capital Markets, in Toronto. The deal made sense for sev- eral reasons, according to Benavente, among them SmartCentres' develop- ment and leasing platform, something that Calloway REIT lacks. In fact, Cal- loway outsourced those tasks to Smart- Centres. "When they did the merger, Calloway acquired all of that platform, so if it wants to develop or redevelop, it can do that in-house," said Benavente. Calloway gets something else in the transaction as well: SmartCentres has a close relationship with Wal-Mart Stores, which has been very successful in Can- ada. Indeed, most of the SmartCentre properties were Walmart-anchored. "As Walmart grows in Canada, Calloway will develop more shopping centers for the American retailer," said Bena- vente. "There is even speculation that Calloway REIT might develop some Walmarts in the United States." Like Australia, Canada is a huge country with a smallish population base and thus a limited number of quality portfolios to be merged. In addition, Canada's largest REIT, shopping cen- ter owner-manager RioCan REIT, has shifted more to developing than to acquiring, Benavente observes. "It is selling assets ó shedding lower-growth, weaker shopping centers," Benavente said. The Calloway transaction makes for the second-largest Canadian retail REIT, with assets of $8.3 billion, versus RioCan's roughly $15 billion in assets. Paris-based Klépierre has shop- ping centers in most of the major cit- ies of Western Europe and Turkey. Netherlands-based Cório held a simi- lar, if smaller, portfolio of retail prop- erties across the Netherlands, France, Italy, Germany, Spain and Turkey, which makes this cross-border deal a classic instance of a larger shopping center company bulking up by acquir- ing similar assets. While a handful of public REITs dominate the U.S. mall market, this is not the case in the shopping cen- ter world; there are so many shop- ping centers and owners that no one company dominates. Consequently, a merger among shopping center own- ers can be efficient. "When a shopping center owner meets with a retailer, it can bring out its portfolio book and say, 'We have opportunities in these 10 markets,'" said Diane Wade, a principal and senior analyst at CBRE Clarion Securities, in Radnor, Pa. "And the shopping center market is still so highly fragmented that no one company dom- inates a single market." In the shopping center industry, mergers are the result of different scenarios for different compa- nies, according to Wade. "In some situations it makes sense for the companies to be merged into a larger company with a lower cost of capital," she said. "In a situation where two compa- nies are competitors with complemen- tary markets, it makes sense to come together to create a stronger company, although individually the two compa- nies were holding their own by them- selves." From an overhead perspective, for public companies especially, "bigger is better," according to Wade, "because you can stretch your personnel, not to mention reducing fixed costs." The problem is that a merger could turn out to be more difficult than ex- pected. "From a financial standpoint, it is just a matter of going through the numbers and making sure they work," said Maloney. "The human aspect is, a merger or acquisition can get dicey but can be the most rewarding. You are tak- ing two companies with different cul- tures and leadership and melding them together. Strong leadership is essential to evaluate both companies, take the best practices and move forward." Simon has historically been an active buyer of other property companies, and it is the major shareholder in Klépierre, along with two other European financial institutions. In the U.S., Washington Prime Group was a spin-off from Simon. When two companies come to- gether, "one side becomes the winner over a period of time," Maloney ob- served. "That's not a bad thing." S C T A u g u s t 2 0 1 5 / S C T 51 "Where two companies are competitors with complementary markets, it makes sense to come together to make a stronger company."